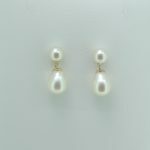 These black button pearl stud earrings, featuring 6-9 mm diameter cultured freshwater pearls are set on 9K yellow gold (or sterling silver fittings), so there is no need to worry about allergies if you are giving them as a gift. 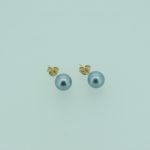 The lustre of these black pearls draws attention to the earrings even though they are the very simplest of designs, made to nestle against the earlobe and wait to be noticed. They are ideal for ears with multiple piercings as they will blend with any other earring, even if the others are very shiny; in fact, paired with diamonds they would look stunning.